When I was a child, a visit to my grandparents was a magical event. They had a farm with gardens, cows, tractors and sometimes even horses. My brother and I were transformed into free-range children, loosed to explore the edge of the woods, climb big hills of red clay and ride the Big Wheel up and down grassy slopes, dodging excited dogs and fallen tree branches along the way. The food was also an adventure. I can’t think of my grandmother without picturing her in the kitchen, mixing biscuits by hand, cutting up potatoes or rolling out a pie crust. One of the culinary experiences we looked forward to the most was homemade ice cream. My grandmother always kept one of those old-fashioned hand-crank wooden barrels on the back porch; once it was deemed hot enough outside, she would make a ton of ice (or get someone to pick up a couple of bags on the way back from town), gather the salt, make the ice cream base and prep the grandkids for hard labor. Because if we wanted ice cream so badly, we were going to have to work for it, turning the crank until the mixture thickened so much that we our little arms just couldn’t turn it anymore and our grandfather had to come to our rescue and finish the job for us. The ice cream always came out thick and delicious, not as firm as it would be after a couple of hours in the freezer, but good enough to eat without having to wait. And while we were good kids, waiting for ice cream after all that work was not on our list of things to do. Fast forward to the late 1990s, when I my husband gifted me with an electric ice cream freezer. I was disappointed when my first batch emerged from the canister not merely soft, but soupy. When the second and third batches did the same thing, I packed the freezer away and gave up. I was on the verge of tossing the freezer a couple of years ago when I gave it one more chance and it redeemed itself with a recipe for strawberry ice cream from the Ben & Jerry’s recipe book. Alas, that’s the only ice cream recipe that emerges from the maker ready to eat. 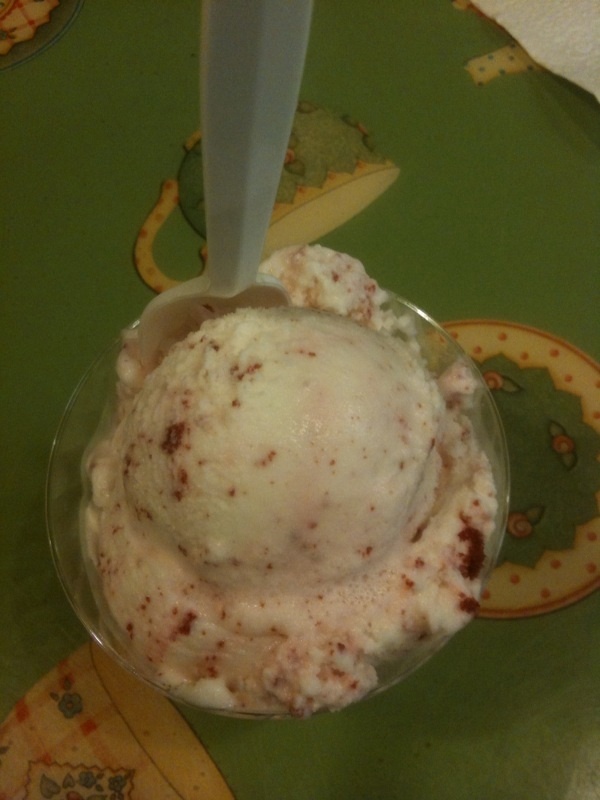 I’m ready to give it another go, however, because the Red Velvet ice cream from Jake’s Ice Cream in Atlanta is everything I’ve tried to accomplish in homemade ice cream and more. It was like a fresh piece of cake, cream cheese icing and all, mashed up in a scoop of ice cream. Only it had all been frozen together at once, without the cake drying out or freezing into crunchy, unsatisfying bits. We visited the Irwin Street Market location of Jake’s, a former warehouse housing several creative food vendors. The building’s got kind of a Lowe Mill feel, for any Huntsvillians reading, only on a smaller scale. The husband had the Nutella flavor, which I don’t even SEE on the menu. Jake must spend his days dreaming up awesome new flavors. I want Jake’s job. Anyway, I’m trying to decide whether to dump a measure of red velvet cake and cream cheese icing into my unpredictable (or, I guess, quite predictable) ice cream maker or just mash some cake and ice cream together toddler birthday party style. It’s a win either way, right?